Ali Gohar (in vest), MA ’02, speaks among a circle of Pakistani men who are considering ways to meld traditional jirga practices with modern concepts of human rights. For his extensive work in this field, Gohar received the 2015 CJP Alumni Award for Outstanding Service. Ali Gohar looked out of place at the train station of Bradford, England, on a drearily damp-cold November day in 2014. Not because he’s Pakistani – about a quarter of Bradford’s half-million residents have recent roots in Britain’s former colonies in and around the Indian subcontinent. It’s just that Gohar looked as if he were still living and working among his beloved Pukhtoon people in northwestern Pakistan. Gohar was wearing his traditional Pukhtoon garb – a brown coat and a vest over a tunic extending to the knee, over white linen pantaloons. On his head sat a pakol, a soft, round-topped men’s woolen hat typical of his home region. Gohar looked much as he does in photos taken at jirga meetings in conflict-gripped regions of Pakistan that border Afghanistan – namely Baluchistan, Khyber Pukhtoonkhawa and the Federally Administered Tribal Areas. Gohar admitted to feeling stuck in Bradford, a former factory city that once claimed to be the wool-processing capital of the world. Today its factories stand empty, and the working-class housing is mainly occupied by relatively recent arrivals to Britain, hoping for a more secure life than they had back home. Meanwhile, Gohar says it’s been a challenge to travel extensively to do his peace work in some of the most violent areas of Pakistan – with funding inconstant, depending on the priorities of the donor agencies – while simultaneously trying to be a good husband and father. When his wife sought to move herself and their four children from Pakistan to England, Gohar went along with the idea on a trial basis. But one year has turned into six, and the children have thrived in Bradford’s school system, surrounded by many students from their home country. The Gohar family’s love and devotion is obvious when they’re all in the same three-room flat in Bradford, with the 22-year-old twins (one of each gender) usually studying science books in one small room in their quest to be physicians, while Dad, Mom and the younger two girls sit in close proximity in the almost-as-small living room, working on their projects late in the evening. If a Skype call comes in, everyone gathers to smile, wave, and say hello into a laptop screen. After Gohar’s family gets its residency, though, history suggests he will be on a plane, heading back to the place where he has deep roots and loyal staff, working from an office that doubles as his sleeping quarters in Peshawar, Pakistan. Once there, if the past is a predictor, Gohar will rely on Skype to stay in touch with his family, plus an annual visit of a couple of months. In 2002, after Gohar finished his master’s degree at the Center for Justice and Peacebuilding (CJP) of Eastern Mennonite University (his Fulbright scholarship provided just enough for his family to live in the attic of a house near campus), they all returned to Pakistan where Gohar worked with another CJP graduate to co-found what is now called Just Peace Initiatives. Funding was non-existent those first few years, and the other alumnus, Hassan Yousufzai, soon shifted from Just Peace to government employment. Just Peace now has five professionals as its core staff, plus two support staff (a watchman and a driver). Another 20 or so university-educated Pakistanis have been through Just Peace trainings and are hired when grant money permits. The unevenness of the flow of grant money means their income is never certain, though. Cherished staffers have needed to take other jobs during lean times, returning as volunteers when they can. Truth be told, Gohar pockets so little from Just Peace that each of his family members old enough to work holds paid-by-the-hour jobs in Bradford (one of them does double shifts, working two jobs). The family lives much less securely, for example, than that of fellow Pakistani graduates of CJP who hold government positions. Normally an optimist, Gohar confesses he reached a nadir in 2011 when Just Peace chief executive Javed Akhathar was shot and killed while traveling by car. Just six months previously, the man’s 22-year-old son had died of cancer. Akhathar’s widow and the two remaining children needed all the support Gohar could muster. Always in the back of Gohar’s mind is this story: Gohar’s maternal grandfather responded to the Bacha Khan’s call and became a Servant of God. Arrested by the British, he spent years in prison, enduring beatings and other forms of torture, including a winter’s night in freezing pond water. He lost his eyesight and his mind as a result of this treatment, spending the rest of his life bitter and angry. Gohar’s grandmother and the children survived by selling the family’s land, piece by piece. More family tragedy centered around revenge killing, in the Pukhtoon tradition. Gohar’s maternal great-grandfather was killed in a dispute in 1923, causing the son who became a Servant of God to be raised fatherless. A maternal uncle of Gohar’s decided to take revenge for this 1923 offense by killing in 1996 the grandson of the 1923 killer. This maternal uncle was then killed in 1971. Another Gohar uncle took revenge in 1973. And it kept going. Jirga members approached Gohar’s maternal uncles and separately approached men from the other family, using what Gohar calls “parachute diplomacy.” Deciding eventually that the feud needed to end “for the sake of God,” the families extended forgiveness to each other “without even payment of blood money,” ending the multi-generational cycle of violence. The success of jirga (a traditional consultative process for resolving community problems) in addressing his family tragedy helped Gohar to see its potential for implementing a Pakistani form of “restorative justice,” as it’s called at CJP. “My Pukhtoon culture is at least 5,000 years old,” Gohar says proudly. “Our system of jirga has been part of our culture since long ago. About 90% cases in rural areas and 70% in urban areas are still resolved through jirga. Since the system still functions and is respected, it needs to be used” – preferably, he adds, informed by modern concepts of human rights, restorative justice practices, women’s participation, and decisions that are documented. “Everywhere in the world, it is important for restorative justice practices to be embedded in the local culture and context, or local people will not feel that they own them,” he explains. Gohar and his staffers almost always start their Just Peace workshops – which may be as short as a day and as long as three days – with a reading from the Quran and a story relevant to them. He says he wants each participant to seek to have a clean mind and heart, “to fight within their own souls” to build peace. Gohar reminds his listeners that the Prophet Muhammad (Peace Be Upon Him) asked his followers to respect life, calling the life of one person more sacred that the holiest place on earth. Moreover, in both the eyes of the Muhammad (PBUH) and that of Pukhtoon tradition, men who fail to honor women – who raise their hand against them – are acting shamefully, notes Gohar. He points out that Muhammad (PBUH) forgave his enemies, including those who killed his uncle. In recent years, when equipment is available, Gohar brings along a CD to show a half-hour dramatization of a true story – one which he scripted for production by Pakistan Television – of a young woman who, after being violated by a man, nearly loses her life due the practice of honor-killing. The show is one of four written by Gohar, all with social justice themes, which have been broadcast on national television. Somewhere during his workshops, Gohar typically points to his personal hero, Abdul Ghaffar Khan (1890-1988), a friend of Gandhi’s who fought nonviolently for his people’s independence from the British in the mid 1900s. The Bacha Khan, as he is affectionately called, was a Pukhtoon political and spiritual leader (100,000 followers in his non-violent army, called “Servants of God”), a lifelong pacifist, a believer in the equality of women, a champion of the poor, and a devout Muslim. According to a 2013-14 research paper co-authored by Gohar and Australian criminologist John Braithwaite, Gohar’s work is not universally popular in Pakistan. Some professionals, notably city-based lawyers, object to Gohar’s view that the traditional approaches to justice in rural Pakistan should play a role in modern-day Pakistan. They don’t agree that indigenous-style dispute resolution offers locals an alternative to the regular court system. Almost nobody disputes, however, that cases tend to drag out for years in Pakistan’s court system, with fees and payments typically greasing the process and tilting the wheel of justice toward the rich and powerful. In editorial commentaries and blogs, some women’s and human rights groups have argued that traditional “elders” identified by Just Peace are always men, often holding ignorant (even abusive) views on women and members of minority groups. Gohar nods and smiles wanly when these criticisms are raised in person. He doesn’t disagree. But he does disagree on how change best occurs, on how cultural attitudes shift. From experience, he feels he achieves more engaging people conversationally, rather than confronting them angrily, head on, causing them to react to protect their honor – especially in the honor-driven Pukhtoon culture. As a way of offering a complementary alternative to male-controlled jirgas – which admittedly operate without formal checks and balances – Just Peace has promoted a “hybrid” (Braithwaite’s word) approach since 2008. The approach is embodied in what Just Peace calls muslahathi (“reconciliation”) committees, which don’t necessarily replace jirgas. They simply give community members, especially women, another option for dispute resolution. Ideally, these muslahathi committees consist of respected members of civil society, including several women, plus one police officer who is charged with reminding committee members of relevant human rights laws. Unlike the informality of jirgas, the decisions of the committee are supposed to be recorded for future reference. Operating under the auspices of the local police station, it was thought, would also give members of these committees a measure of protection against attacks by the Taliban. In their 2013-14 paper, Gohar and Braithwaite describe how the Taliban typically move into lawless situations and eventually kill even respected elders who deliberate in jirgas, viewing them as competitors for the people’s loyalties. 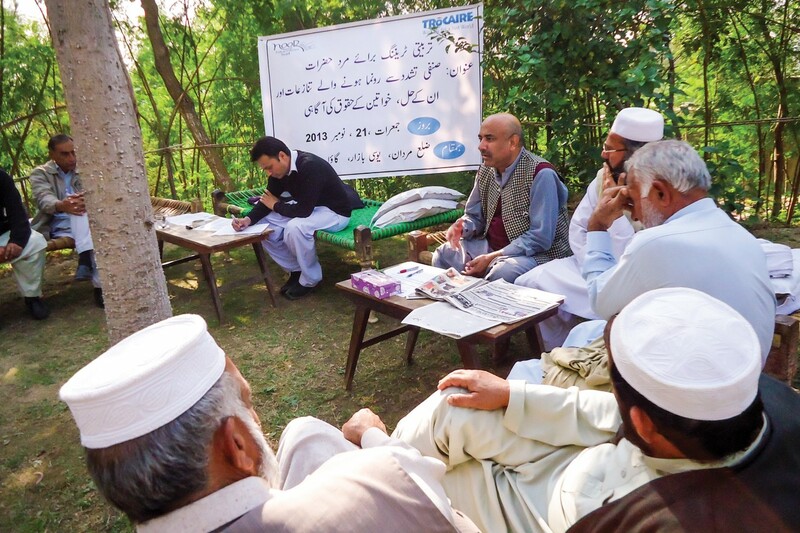 With financial support from the Australian government and Asia Foundation from 2008 to 2010, Just Peace succeeded in launching these muslahathi committees, with trainings provided to all committee members, in 73 village-level police stations in the volatile district of Khyber Pakhtunkhwa. At the time, Just Peace’s work benefited from the strong endorsement of Malik Naveed, a high-ranking police official who was inspector general of police for Khyber Pakhtunkhwa. 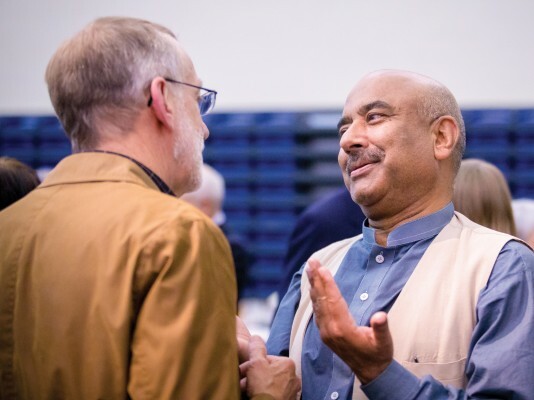 Naveed and Gohar met at a restorative justice symposium in Peshawar in 2003 – also attended by Braithwaite – and decided to collaborate on adapting restorative justice practices to Pakistan. This collaboration has proved to be both a blessing and a curse for Just Peace Initiatives. The blessing was being able to see if the muslahathi committees were workable. And – as Braithwaite found in the spring of 2013 when he spent a month in Pakistan doing research that included site visits, interviewing muslahathi committee members, and reviewing their records – many of them worked remarkably well, even continuing to function on a voluntary basis when outside funding (and trainings) ceased in 2010. These committees, whose members receive no pay (other than the police officer on his usual salary), had successfully settled civil disputes involving businesses, land, gambling, roadways, water usage and other environmental concerns, treatment of women, and more. In so doing, they had extinguished sparks that typically fueled cycles of violence. The curse aspect came from Just Peace being associated with inspector general Malik Naveed when, in 2010, he was accused of illegal activities not related to the functioning of the muslahathi committees. To this day, Naveed is fighting court charges pertaining to embezzled payments for large-scale arms sales. And, to this day, Gohar emphasizes that Just Peace has never benefited from any arms sales (an activity that would violate Gohar’s pacifist principles, in any case), but is an organization that – then and now – operates frugally and is happy to have its activities monitored by anyone at any time. As an example of the social-support role of muslahathi committees, Braithwaite cited a situation in 2012 where hundreds of people fled the fighting between the Pakistani army and Taliban in the Swat Valley and arrived in Abbottabad District (known today for being Osama bin Laden’s last place of residence.) The locals hospitably opened their homes to them. The local muslahathi committee helped the Internally Displaced Peoples (IDPs) – including those involved in the violence – to rebuild a destroyed house, even supplying building materials and their own labor. Peace was restored between the host community and the IDPs. In early 2015, a year after Braithwaite wrote these words, Gohar expressed regret to a Peacebuilder reporter that Just Peace has not been able to secure funding to continue to train, advise and monitor existing muslahathi committees, much less establish new ones. Written scripts for nationally broadcast programs aimed at combating drug use, preventing AIDS, reducing domestic violence, stopping honor killings, and introducing restorative justice. Produced books and manuals in both English and Pukhto that offer instruction on the basics of conflict transformation, including A Little Handbook on Restorative Justice co-written with Howard Zehr, Distinguished Professor of Restorative Justice at EMU. Collaborated with CJP research professor Lisa Schirch in producing an op-ed piece “Lessons from South Asia for an Arab Spring,” plus articles on the role of rituals in peacebuilding, the role of Pakistani civil society in peacebuilding, and the way drone warfare contributes to the growth of terrorism. Worked in settings as varied as public schools, refugee camps, hurjas (village community centers), universities, churches and madrasases (Islamic schools). In the first six months of 2014, for example, Gohar facilitated eight three-day workshops in three locations in the northwest tribal area of Pakistan, reaching 90 female and 150 male teachers on restorative methods of handling conflict with students, reintegrating drop-outs, and addressing students’ trauma and other psychosocial problems. Over the years, major funders of Just Peace projects have included United Nations agencies (UNDP, UNHCR, UNFPA, UNICEF, UNOCHA), Asia Foundation, the Australian Department of Foreign Affairs and Trade, the Greek Ministry of Foreign Affairs, the European Union, Catholic Relief Services, U.S. Institute of Peace, Concern Worldwide, and International Fellowship of Reconciliation. About 6,000 have attended one of the day-long workshops held by Just Peace in all four provinces of Pakistan since 2003, and 2,027 have attended one of the three-day Just Peace workshops. The attendees included 900 women. In conditions where hundreds of jirga leaders have been assassinated by the Taliban, and jirgas attacked by suicide bombers (because jirgas are more popular than the Taliban justice system), Just Peace Initiatives has innovated with collaborations between state justice and restorative justice in order for jirgas and muslahathi committees to be held in secure conditions. Under the inspiring leadership of Ali Gohar, Just Peace Initiatives has been a practice-based think tank focused on retrieving the wisdom and the restorative qualities of Pukhtoon traditions, while also campaigning for respect for human rights. For more information, read Towards Understanding Pukhtoon Jirga: An Indigenous Way of Peace-Building and More (2012), by Hassan Yousufzai and Ali Gohar, available via amazon.com. 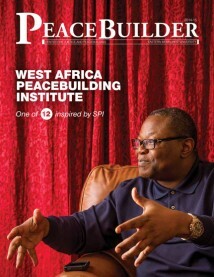 Articles on the topic may be found on justpeaceint.org. Visit this link to view an English subtitled edition of the show. Malik Naveed had first been introduced to concepts of restorative justice at a 2002 United Nations Asia and Far East Institute conference in Japan (Braithwaite was there, too). Afterwards, Naveed contacted CJP professor Howard Zehr, an internationally known expert on restorative justice, who told him he should meet Ali Gohar, Zehr’s former student. In Regnet Research Paper No. 2013/14, pages 23-27, John Braithwaite discusses at length “legitimacy challenges” to the work of Just Peace, including its being maligned by a widely circulated, anonymously written news blog (easily located online by typing “KPK police embezzled millions”) addressing financial corruption linked to police inspector general Malik Naveed. After Braithwaite fact-checked a number of the assertions in the 2013 news blog – though the main source quoted, Dr. Murtaza Mughal, did not respond to Braithwaite’s queries – Braithwaite concluded that the aspersions cast specifically on the work of Just Peace did not hold up to scrutiny. In fact, they were contradicted by Braithwaite’s own on-the-ground month-long research project in Pakistan that same year. Visit justpeaceint.org for considerable information, including photos, video clips, newspaper reports and research publications.